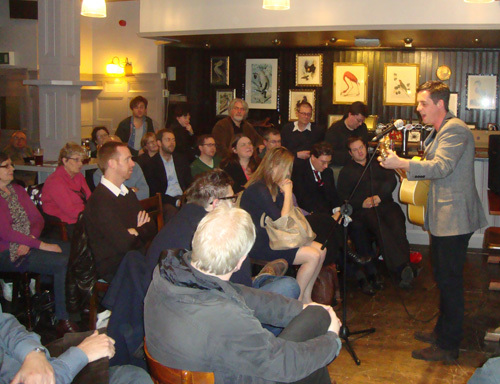 Once again, a full house at The Bell in Spitalfields were subjected to – I think it’s safe to say – a superb evening’s historical entertainment. 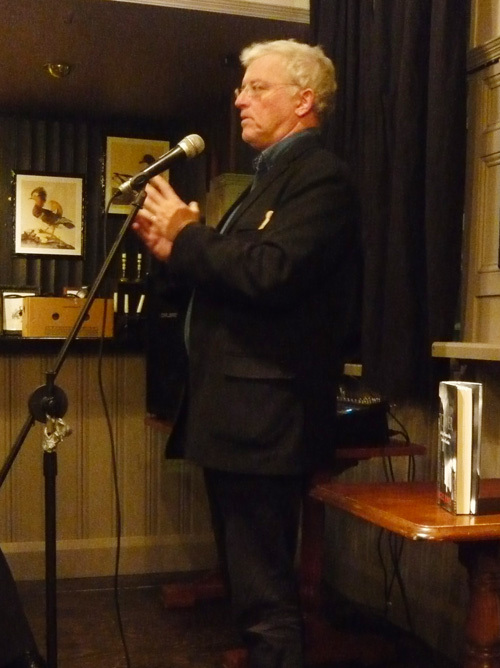 Nigel Jones, author of a new book on the Tower of London, kicked off proceedings with some highly amusing anecdotes about escapees over the centuries from what most people don’t realise was a somewhat leaky prison. 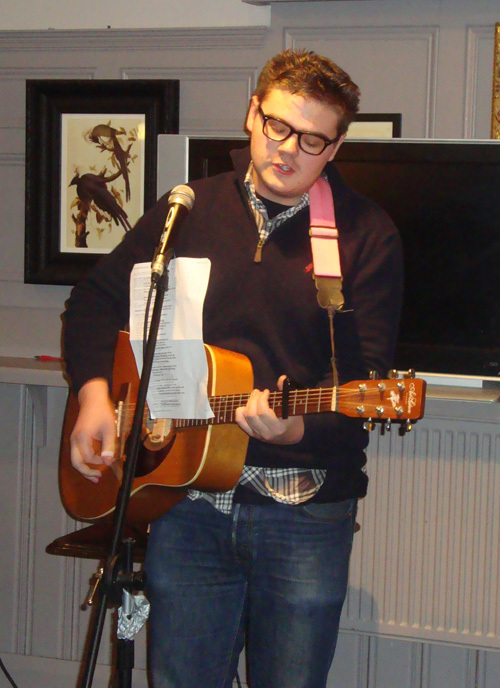 Ruairidh Anderson reprised his appearance from History in the Pub I with a set of brilliant songs and stories from London’s old East End. Ruairidh is also doing a series for Londonist about the Olympic boroughs under the Folk Olympics strand. Here’s an example. We were treated with not one, but two balladeers. For then Henry Skewes gave us a song about an appalling death in the 18C St Giles workhouse. This was by way of introduction to Professor Tim Hitchcock‘s talk: The Workhouse Cruelty: Death and outrage in early 18th century St Giles all about the introduction and social impact of this peculiarly British institution. A deeply absorbing topic. 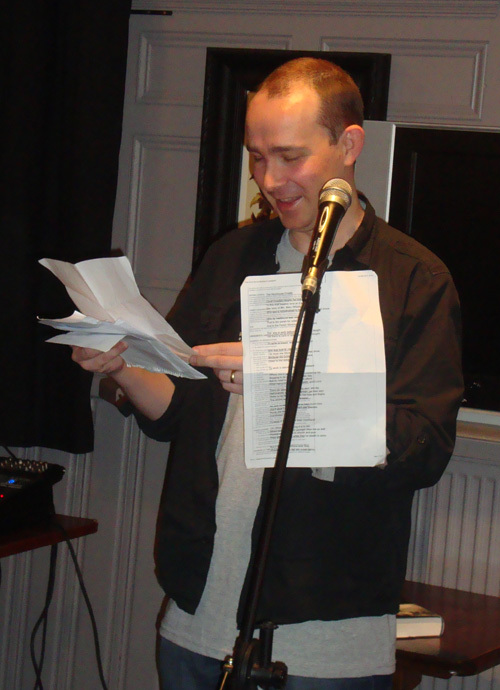 The evening was spiced with Matt Brown’s speed quiz, whose topic was the history of Christmas in London. Challenging questions which our audience rose to magnificently. The winner received a signed copy of Nigel Jones’ above-mentioned book. 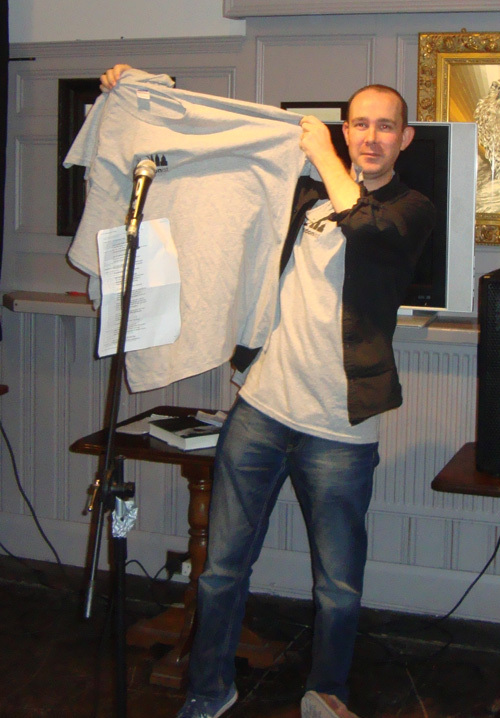 The runners-up got snazzy t-shirts, kindly provided by Londonist. 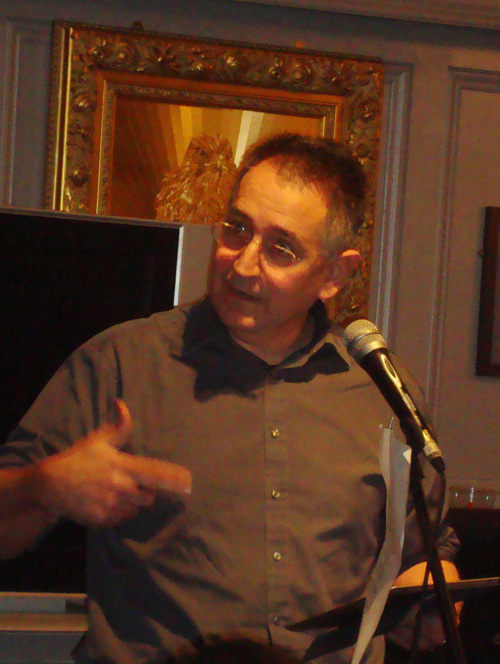 We also had two prize draws: a signed copy of Tales from the Hanging Court by Tim Hitchcock and Robert Shoemaker; and a year’s membership to London Historians, won by Christina Torres. Welcome, Christina! Proceedings were brought to a close when landlord Glyn had to beg the remaining hard-liners to vacate his pub at about 11:30! A splendid evening. 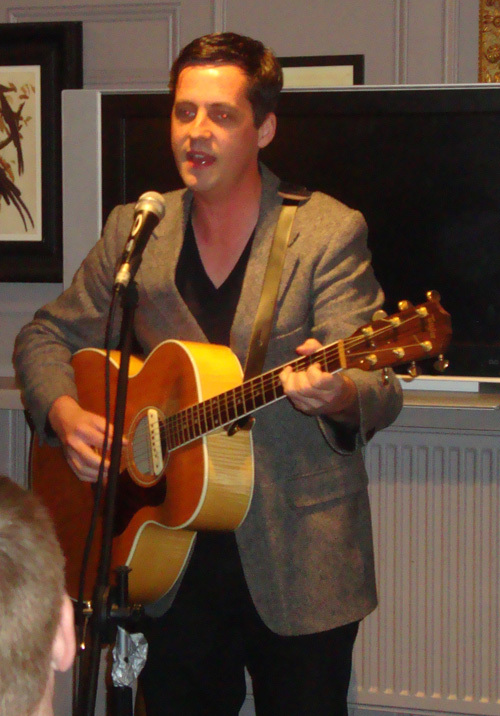 Many thanks to our speakers and singers, all superb; a big thank you to Matt Brown for being MC and preventing anarchy; but thanks most of all to all who came and supported our event. I hope you had as great a time as I did and we look forward to the next one, we’re thinking February 2012. Here are some pictures. I don’t think the light in The Bell and my camera get on very well, but you get the idea. ...and is later on amused by some of the answers. Forgive me for train geekery of late! 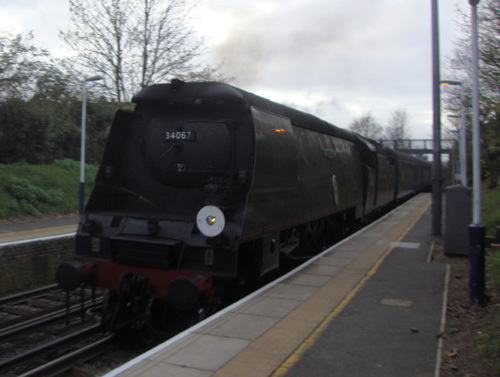 Thanks to a tip-off via IanVisits, about half an hour ago I raced down the road to Brentford station to witness this 1947 Battle of Britain class steam train pass through on its way to Euston. 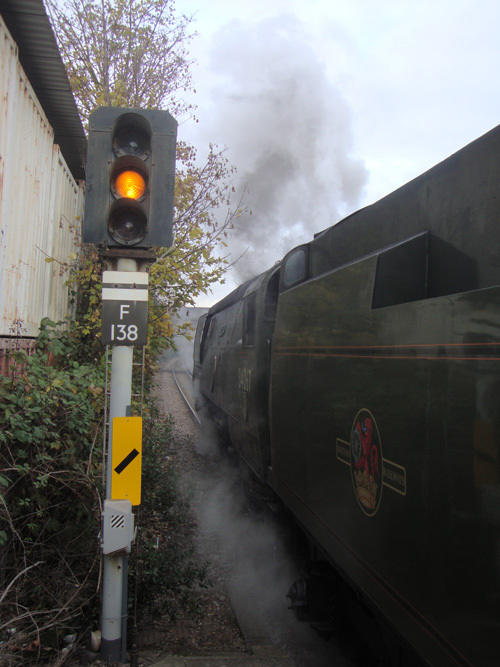 The loco wasn’t particularly noisy and it smelled lovely. 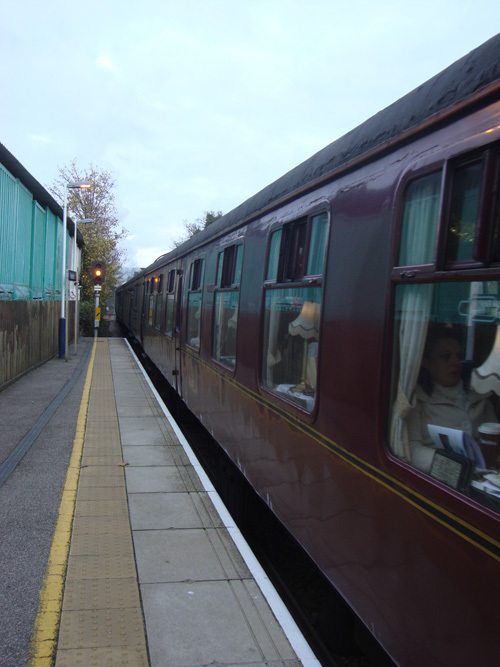 The passengers, steam enthusuasts and nostalgia seekers presumeably, appeared to be enjoying a swanky luncheon. 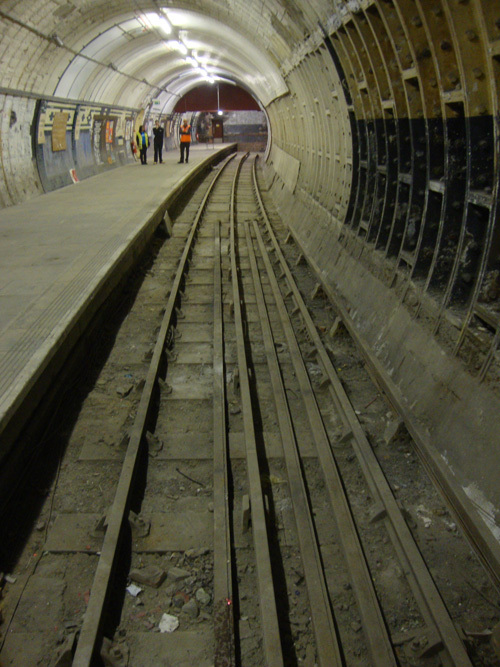 Most Londoners know that there are “ghost stations” on the Underground network. There are probably several dozen of them in all, most of which have been closed for reasons of economy, the fact that they simply weren’t pulling their weight financially. 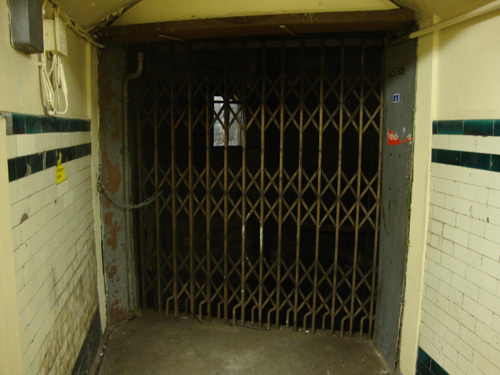 One of the more recent, perhaps the most recent, is Aldwych Station in the Strand, which closed its door to travellers in 1994. 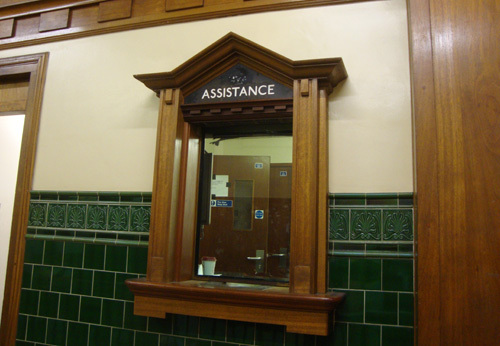 It was built in 1907, designed by the leading Tube station architect of the era, Leslie Green. 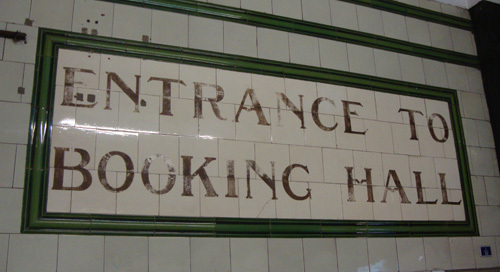 You can usually tell Green’s stations by the distinctive “ox-blood” tiling and the vaguely Arts Nouveau lettering on the main station signage. Russell Square is a good example. 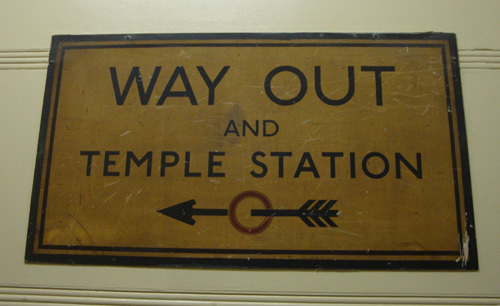 Aldwych was used as a public bomb shelter in both World Wars, but particularly in World War II when it was actually suspended from the network entirely between 1940 and the end of the war. 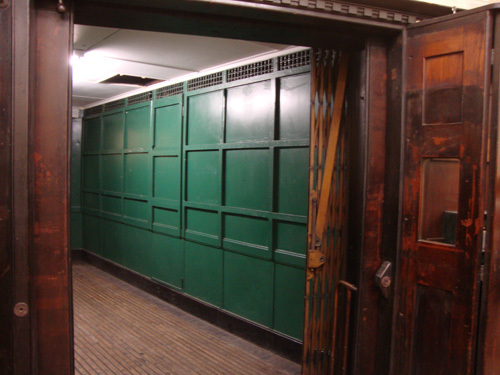 Part of it was used to store art treasures, notably the Elgin Marbles. 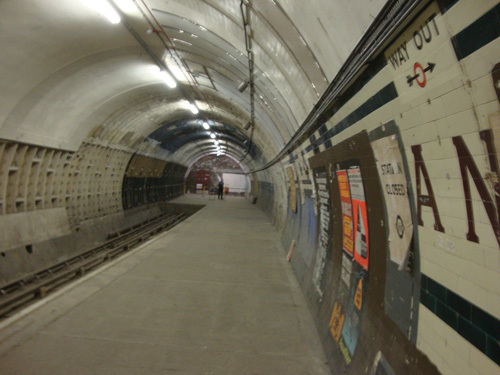 Today, Aldwych’s main function is to be used as a film set for period movie and TV dramas that require an Underground setting. 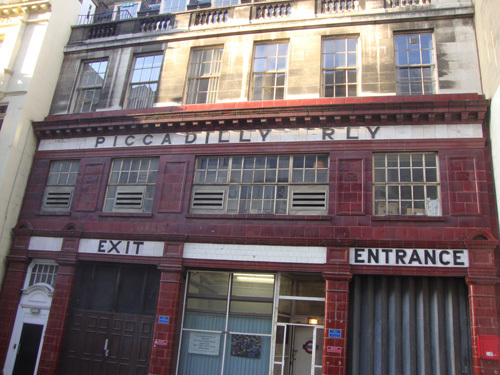 On extremely rare occasions, the London Transport Museum opens Aldwych to the public for guided tours. Today was the first day in such a programme which ends in early December. 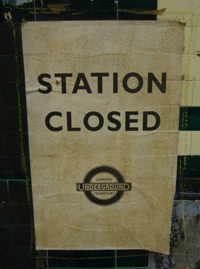 Tickets sold out within days, but LTM kindly provided three for London Historians today. For reasons of Health and Safety, the tour was extremely tightly regulated. But actually, since the station was only decomissioned relatively recently, the old place is very little different from any of the stations in use, and, with only 70 of us in attendance and no tube trains roaring through (obviously), a great deal safer than visiting any station on the network, any day of the week. It is my contention that LTM could run these tours far more frequently, with fewer staff, and open up for themselves a very decent revenue stream. 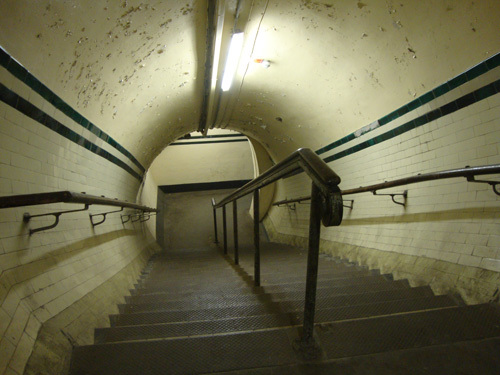 It would also be rather good – and yes, I am well aware of the logistical difficulties – if London Transport or LTM made some of the other ghost stations available to visit on occasional special tours. There are plenty of London historians and railway nerds who would jump at the chance. Having said all that, the tour was immensely enjoyable and below is a small selection of pictures I took. 160 steps back to the surface - easy! 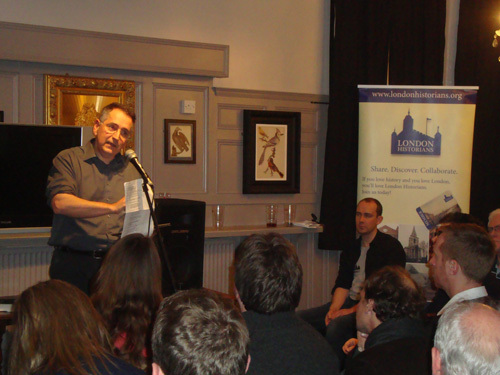 Following the great success of our inaugural, experimental History in the Pub on 21 September, we have decided to squeeze one in before the year draws to a close, and then put together a fabulous programme for 2012. 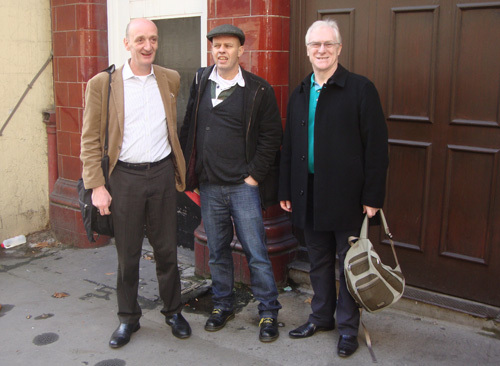 History in the Pub II is next Tuesday, 29 November, again upstairs at The Bell in Middlesex Street, Spitalfields. 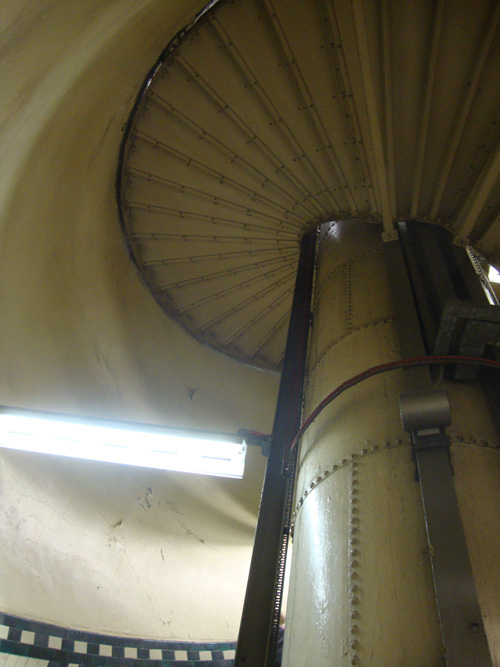 Best tubes are Aldgate, Aldgate East or Liverpool Street. 7 pm start, doors open at 6:30pm. 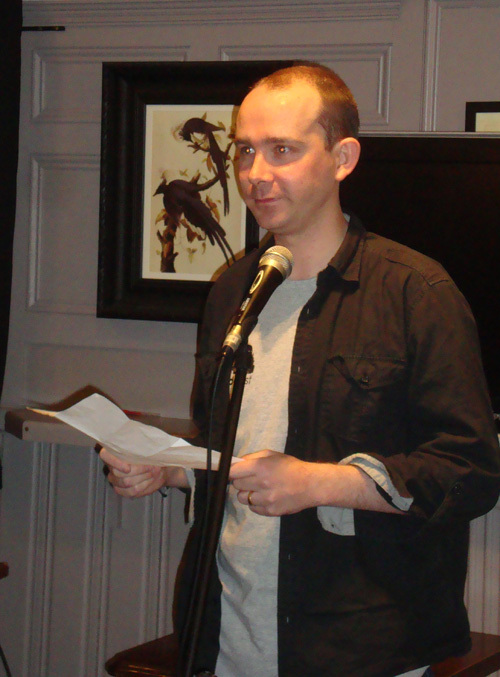 Once again Matt Brown will MC the evening and run the Speed Quiz while Ruairidh Anderson has kindly agreed to return to give us some more of his amazing anecdotes and ballads from the old East End. The other stars of the bill are Professor Tim Hitchcock who’ll tell us about 18C workhouses and history author Nigel Jones who will regale us with some strange tales from the Tower, based on his new book, An Epic History of the Tower of London. The evening’s prizes will be two signed books – one of each by Tim and Nigel; and a free annual membership subscription to London Historians. Afterwards, like last time, we can continue drinking and socialising downstairs. 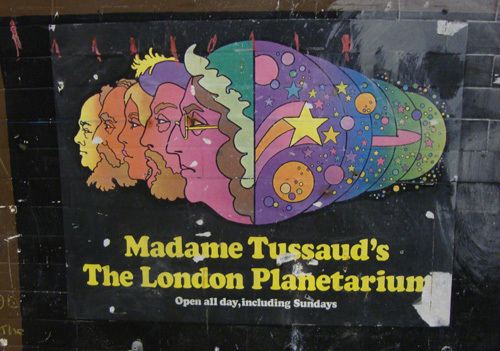 Entry is free for London Historians members, £3 for non-members. History in the Pub I was utterly over-subscribed. Please secure your place asap by emailing admin@londonhistorians.org. Not essential, but please put “HitP II” in the Subject line. 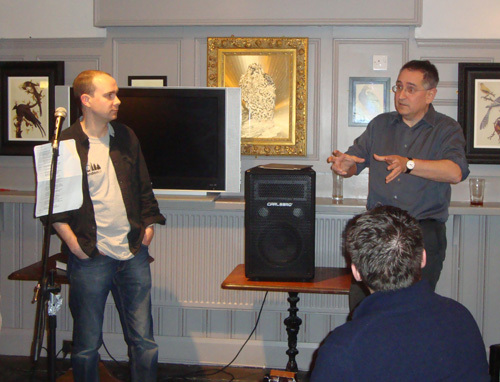 More (or strictly speaking, similar) info on our Events page, here. The other day Demos announced the results of a poll of what symbols made us proud to be British. Shakespeare came out top, followed by stuff like the Pound, the Beatles, the Union Jack, our armed forces etc. 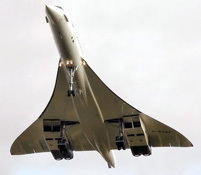 Missing from the list, some eight years after her demise, was Concorde, a symbol which – had she still been flying – would otherwise have figured in the top 10, surely. I am reminded of a friend who, some thirty years ago almost, said: “We only have two things to be proud of in this country: Concorde and David Bowie”. I am writing this now, only because today is the anniversary of Concorde’s inaugural service from London to New York, in 1977. A time when the economy, like today, was in very poor shape. Not quite the same as the early 2000s, when the Air France disaster happened. Millions were invested in modifications to make both fleets of Concorde safer, yet Air France and British Airways scrapped them in 2003. British Airways at that time was run by Australian Rod Eddington. An accountant. 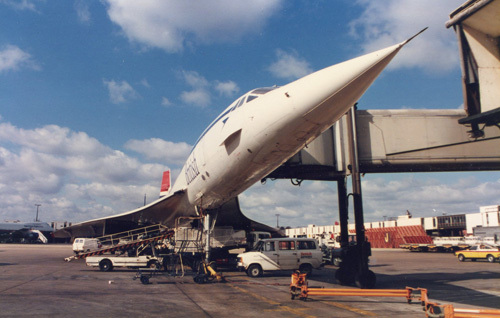 I was one of the relatively fortunate few who flew on Concorde, not through wealth, I must emphasise, but rather as an occasional document courier. But like most people who live within 30 miles of Heathrow, I was a fan. You could set your watch by Speedbird’s take-off and landings and you never, ever didn’t look up as she roared past high above you. 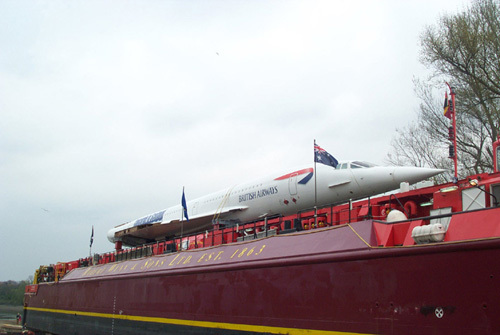 I’ll never forget driving on Heathrow’s western perimiter road as she took off a few hundred feet overhead. The van rocked, the goosebumps instantaneous. Ahhh, how we miss her. 1983. The day I flew Concorde. Charity Christmas Fairs are a good way to gain access to historical buildings while getting some Christmas shopping sorted out. There is normally an entrance charge which is the equivalent of what you would have to pay anyway, and you may get a glass of mulled wine or similar thrown in. 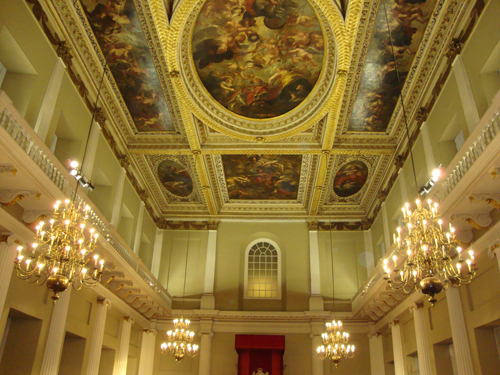 A particularly good one that we attended last year was Save the Children event at the Banqueting House, a highly significant historical building with fickle opening hours. This year, their event is on Tuesday 6th of December, which annoyingly clashes with our monthly pub meeting. But it’s open from 1pm, so easy to do both. Entry is £8. More information here. Banqueting House. A great place to shop. Another one that looks excellent is the Wellbeing of Women Christmas Fair at the Drapers’ Hall on 5 December. Entry is £5. They have a three for £10 offer until 25 November. More information here. If you get wind of any more of these sorts of events, let me know and I’ll update this post. Another one from the ever-vigilant Jo of Westminster Walking, this time Middle Temple Hall on 8 December. A murder, an investigation, a chase, a court case, an execution. That’s what this book is about. 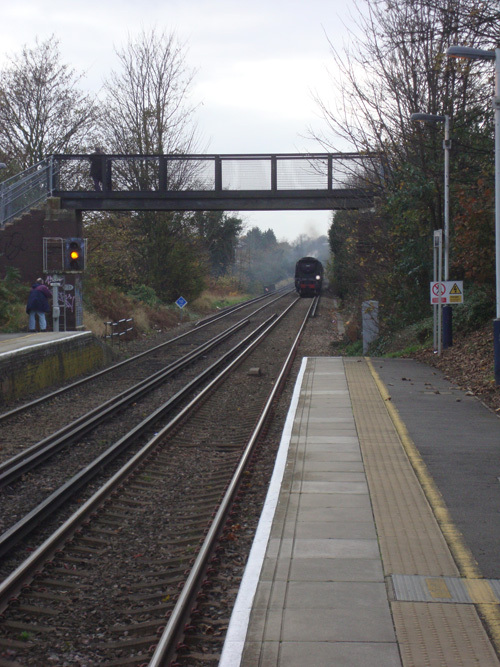 On 9 July 1864, Mr Thomas Briggs – a senior bank official in the City – was murdered while travelling home to Hackney on a train from Fenchurch Street. 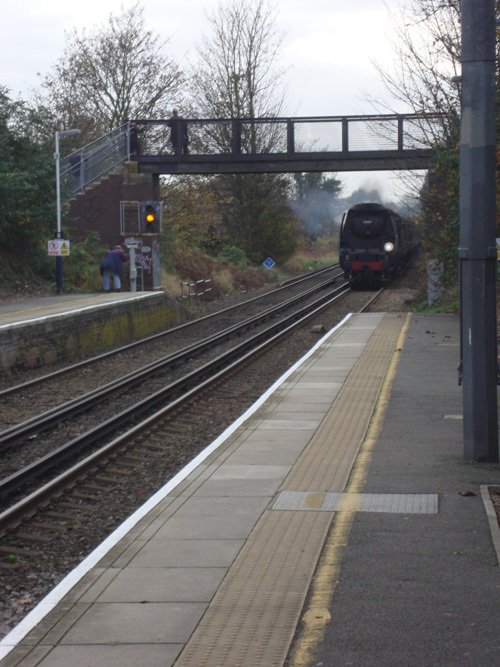 It was the first ever murder on Britain’s railways and it caused a sensation. The story actually involves two hats: Mr Briggs’, which was stolen; and the murderer’s (or possibly one of the murderers’, plural, but I shan’t give the game away! 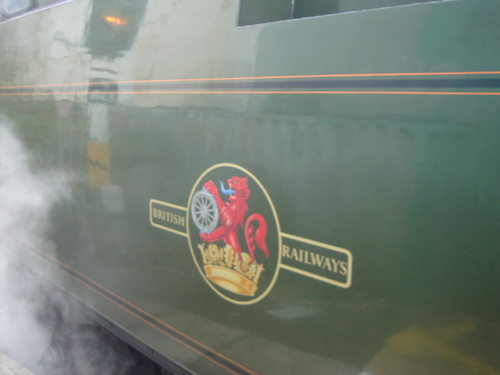 ), which was left in the carriage. Both were recovered. In the days when forensic policing was still in its infancy, it was these items of headgear which were at the centre of both the investigation and the prosecution case. The narrative is compelling, exciting, deeply moving in many places, and gallops along at a good lick, not unlike the popular crime novels of the day: it is high drama through and through. In this sense, it really is a page-turner, as they say. But Mr Brigg’s Hat is so much more than this. It is a thoroughly researched work of history from which the reader will learn much of mid-Victorian London, in particular (in the case of suspects) the daily lives of a specific social layer, I suppose what one might describe the bottom end of the lower middle class, people who lived on the rung above the subjects of Mayhew and Booth. Added to these we have shopkeepers, railway workers, cab drivers, doctors, lawyers and – at stage centre – the first generation of plain clothes detectives, a tiny band of sleuths who carried on their shoulders the expectations of millions of newspaper readers and the reputation of the Met itself. We are given a snapshot in time of 1864 mid-Victorian London. As you read this book, you will learn without noticing all sorts of useful things about the contemporary historical landscape: public transport; the cost of living; the Law; gaol conditions; 19C New York during the American Civil War; contemporary policing. Most interesting for me were two particular issues. First, the role of the press – both popular and upmarket – in informing and influencing the public, police and politicians alike. Reporting restrictions on criminal cases such as we have today simply did not exist. Second, and related: attitudes generally to capital punishment. Large sections of the public loved it for the spectacle, turning out in their thousands: remarkably, a full forty years after the coming of the railways, we still had public hanging in this country. But, as the author demonstrates, at this time much influential opinion was turning against public executions in particular, and capital punishment in general. Yet it took a full century after the Briggs case for the ultimate sanction to be removed from our Statutes. Kate Colquhoun covers these issues excellently, giving the reader much pause for thought. When I review a book, the more I like it, the harder it is to review because I rattle through it happily with hardly at thought to analysis. So if I tell you that Mr Briggs Hat has been particularly difficult to review, you’ll know what a joy it was for me. The author has seemingly without effort and without leaving anything out used 280 breezy pages where another would require double that. Quite an achievement. The book is well-illustrated with photographs, maps, diagrams, prints etc. There are copious notes and references at the back, and a good index. 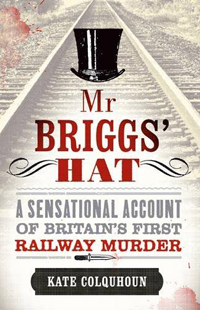 Mr Briggs’ Hat by Kate Colquhoun (339pp, incl notes and index) is published by Little, Brown. Cover price £16.99 but available for £9.00 from our Amazon iStore, here.